An attractive young woman is found dead on a bomb site in the early hours of the morning. At first glance, she is just another casualty of the previous night’s air raid, but when the post-mortem shows signs of strangling, DI Jago is called on to investigate. The dead woman is smartly dressed but carries no identity card. However, a local engineering company reports a member of staff has failed to appear at work that morning and the body is quickly identified as that of Miss Mary Watkins. DI Jago’s initial interviews yield little fruit, no one can think of a reason why Mary would be murdered, but as the investigation continues DI Jago starts to uncover a trail of deception and betrayal. Much has been written and performed about The Blitz and how it was handled by the British public, in particular those in the East End of London. Mike Hollow’s challenge has been to accurately portray that time whilst introducing details that previous works may have missed. In Fifth Column he has met that challenge in spades. I noticed no factual errors and learned for the first time about The Link and The Radio Security Service. From the start the book has great atmosphere with emphasis on Britain’s fragility after the Dunkirk evacuation. Fear and determination fill people’s minds with a few understandably concerned that the country’s leaders may not be making the correct decisions. The darkness of the blackout, restrictions on entertainment and details of the bomb damage all help to build the terror of that era. Fifth Column is not just a story of life in the Blitz, it is also an interesting and multi-angled crime investigation. Hollow gives us various motives, several likely suspects and a few red herrings whilst the story builds up to a dramatic denouement. Fortunately for the reader, once the incriminating evidence is produced the guilty persons all give comprehensive confessions to explain their motives and actions; neatly tying up the storylines. As the lead character, Detective Inspector Jago is all one would expect; conventionally British, dedicated to his work, single and lonely. Some of the other characters are stereotypical but adequate for the tale. 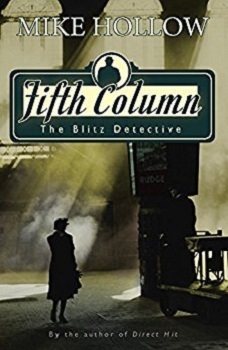 I see that Fifth Column is one of four published Blitz Detective books and I look forward to reading more. I have awarded four and a half stars. Mike Hollow is an Essex man, and Essex, on the eastern edge of London, is where his wartime Blitz Detective books are set – to be precise, in what was then the Essex County Borough of West Ham, his birthplace. After growing up in Romford and studying Russian and French at Cambridge University, Mike worked for the BBC and then for the international development charity Tearfund, a job that took him all over Africa, Asia and Latin America reporting on life in poor communities. Experiences like being stuck in a broken-down canoe several hours up the river from Timbuktu were useful preparation for the solitary life of the novelist. Now freelance, he does a little professional translating to pay the bills but spends the rest of his time hidden away in the cellar of his house in Hampshire plotting the adventures of Detective Inspector John Jago of the Metropolitan Police, who pursues murder investigations as the bombs fall and the fires rage. It’s 1940, and the nightly air raids of the Blitz are destroying lives and homes, but crime doesn’t stop – and justice must still be done.